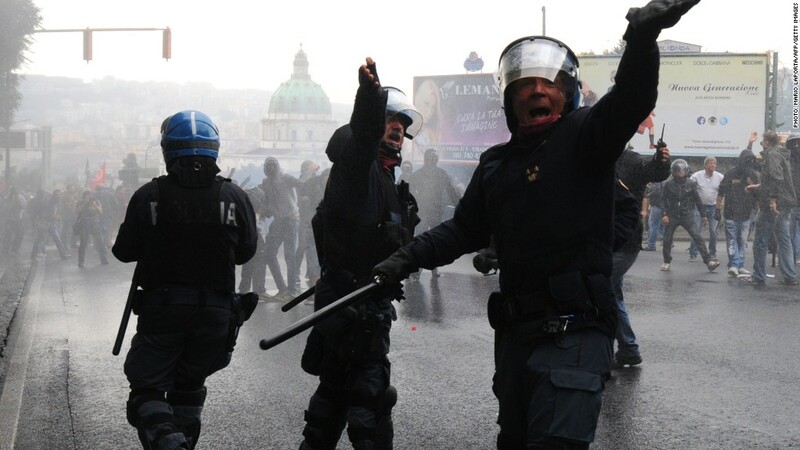 Anti-austerity protesters clashed with riot police outside the European Central Bank meeting in Naples, Italy. The president of the European Central Bank was unveiling details of a program that is aimed at stimulating the economy by getting banks to lend more to European companies and consumers. Loans and mortgages worth as much as one trillion euros ($1.3 trillion) -- including some junk-rated assets from Greece and Cyprus -- qualify as assets that will be purchased by the ECB over two years. There are conditions attached and no guarantee that the central bank will buy them all. The stimulus measures were announced in early September, alongside the bank's second interest rate cut this year. The ECB will start buying some of the assets later this month. The ECB has taken a series of bold policy steps into uncharted territory this year, driven by concern that current very low inflation may turn into a vicious circle of falling prices and economic stagnation similar to the fate Japan suffered in the 1990s. But the outlook has worsened still further in recent weeks, with inflation across the eurozone falling to just 0.3% in September. Unemployment has been stuck at 11.5% for the past three months, and survey data suggests Germany, Europe's biggest economy, may slip into a third recession since the financial crisis. Italy's economy is shrinking again, and France has managed just three quarters of growth in the last nine. That has prompted more calls for the ECB to go all in with a U.S. Federal Reserve-style program to buy government bonds, or full-blown quantitative easing (QE). Thousands of people protested against austerity outside the ECB meeting, held Thursday in the Italian city of Naples. Draghi said he understood why people were angry, given years of recession and high unemployment. But he said their criticism of the ECB was misdirected. "I find the description of the ECB as the guilty actor here needs to be corrected," Draghi told reporters, listing the "unprecedented" measures the bank has taken. He repeated a pledge that the bank would use further "unconventional instruments" if necessary -- seen as code for QE -- to get the economy moving again. He also took a thinly veiled swipe at some European governments for failing to step up. He said monetary policy needed to be accompanied by greater commitment to reform their economies, a remark analysts said was aimed particularly at Italy and France. "We know that our measures are going to be more effective, or may be effective only if other policies are in place," Draghi said. "Each actor has its role to perform."